As you write, it automatically conforms your script to proper movie screenplay format specifications. You can use it on any Internet-ready computer. At less than $5 per month, you can write big budget flicks on a shoe-string budget. Most screenwriting software costs hundreds of dollars up front plus hundreds of dollars later for upgrades. Unless you're already a successful screenwriter, that's too expensive! That's where ScriptBuddy comes in — you get full-fledged screenwriting software at a fraction of the cost. What's more? With a ScriptBuddy Pro subscription, upgrades are included! ScriptBuddy incorporates all of the industry-standard screenplay formatting rules, from margins and indentations to proper page break placement. The ScriptBuddy workstation displays your screenplay exactly as it will look on the printed page, just like modern word processing software. 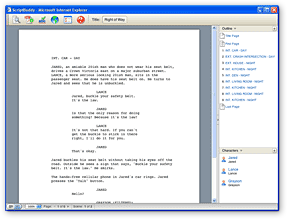 Unlike word processing software, however, ScriptBuddy is built specifically for screenwriting. Aside from automatic screenplay formatting, it also has an outline of your screenplay with numbered scenes as well as an editable character list making it easy to find your way around your screenplay. Something you won't find anywhere else, ScriptBuddy let's you publish your screenplay online for feedback. Our high traffic Community section has tens of thousands of people browsing and leaving feedback for screenplays every month. Some companies charge hundreds of dollars to review your screenplay — it's called "script coverage." Publishing your script on ScriptBuddy is like getting script coverage for free! Click on a screenshot to enlarge. You can sign up to use ScriptBuddy for free. Try it out and if you like it, you can upgrade to ScriptBuddy Pro at any time.